SHE WENT to the doctor, the one at the downtown hospital she's been going to for years, for her annual physical in January. She showed her insurance card when she checked in, and confirmed that the details hadn't changed. The doctor gave her a clean bill of health, renewed her prescriptions, and updated her medical record. It was a routine visit, and she gave it little further thought. Until a bill arrived this week. She was puzzled. The amount due wasn't exorbitant, but she shouldn't have been billed at all: Under her family's health insurance policy, a yearly physical is deemed preventive care and not subject to a copay. She examined the statement more closely, and saw that it was treating her January check-up as two events. One was identified as "Preventive Care" and carried a charge of $465, which was covered by the insurance payment of $319.31 and the hospital "adjustment" of $145.69. A second item, vaguely labeled "Office Visit," was listed as a $397 charge. Of that amount, the insurer paid $113.55, and the hospital adjustment knocked off a further $248.45. That left a $35 balance for her to pay. She called the doctor's medical practice and spoke with the Billing Department. "You probably discussed something with your physician that was outside the scope of an ordinary physical," the clerk surmised. "So when your visit was entered into the system, it was coded for an office consultation as well as a check-up." She thought that was ridiculous — what was the point of an annual exam, if not to speak freely with the doctor about anything? At all events, she had no recollection of discussing an "outside-the-scope" topic, and said so to the billing clerk. So her account has been sent back for a "coding review." She'll have to wait 30 to 45 days for an answer. Against the backdrop of $3 trillion in annual health-care spending in the United States, one woman's frustration with a medical bill may seem insignificant. But who doesn't encounter such frustrations? On any given day, millions of Americans are tearing their hair to make sense of billing snafus and insurance deductibles, prescription co-pays and out-of-network surcharges, baffling reimbursement rules and aggravating Medicare procedures, coding mysteries and paperwork blizzards. They face a myriad of complexities and convolutions that have nothing to do with buying health care . . . but everything to do with expecting someone else to pay for it. 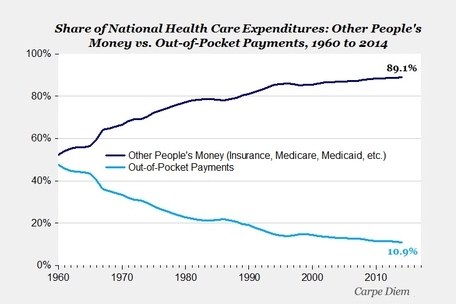 Americans are forever being told that health-care costs are out of control, and that only sweeping government intervention can bring them back to earth. Obamacare was supposed to make medical plans more affordable, but premiums are higher than ever and the government-run exchanges are reeling. Bernie Sanders campaigns on a platform of "Medicare for all" —single-payer socialized health care — yet any such system would inevitably lower the quality of care while raising prices still higher. Any health-care "reform" that intensifies government regulation or enlarges the role of insurance companies only makes a bad system worse. Like the woman described above, most Americans have gotten used to a system in which even their most routine and predictable medical costs must be routed through the maddening labyrinth of insurance procedures. But nothing could be more counterproductive. When Americans rely on a third party — private insurance, Medicare, or Medicaid — to pay most of their medical bills, they forfeit their power as consumers. 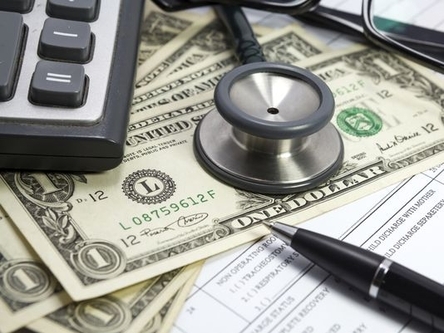 Our ill-conceived system of subsidized health plans provided by employers and taxpayer-funded "free" treatment through the government ends up stripping patients of their economic clout. Doctors and hospitals have little incentive to compete by lowering prices, because patients rarely bother to ask about prices. By and large, health-care providers in the United States do most of their negotiating with insurers or the government. After all, they're the ones paying the piper. It's only when medical services aren't reimbursed by a third party — think of Lasik eye surgery, or veterinary care, or the growing number of direct-pay "concierge" practices that don't accept health insurance — that the consumer is king. When providers are paid directly by customers, transactions are transparent, prices fall, choices proliferate, and consumer convenience becomes a priority. Bills reflect actual prices, not inscrutable codes and deductibles and "adjustments" negotiated way over patients' heads. The purpose of insurance is to protect policyholders from unforeseen or catastrophic expenses. Nobody taps auto insurance to pay for tuneups or new tires; we use it when the car is rear-ended or stolen. We shouldn't be using health insurance to pay for routine checkups, either. If it seems odd to say so, that's only because we've convinced ourselves that normal medical expenses shouldn't be treated normally. If we want health care to cost less, we should pay for it ourselves.